For your goats� happiness and well being, it is vital to include them in on some of your celebrations. After all, they like to party too. You can�t always bring the goat or goats into the house to party, but you can take the party to them. When my sister called up Sunday afternoon to say she was bringing out Lee�s birthday gift a bit early since she had to work on Tuesday, I said okey dokey. Because a plan was starting to form in my brain. Lee was up in the woods cutting firewood, and to be social, the big herd of does had decided to go with him. There wasn�t much to eat there, all the leaves were off the trees, and they had their round bales at the barn. They were just use to going with Lee when he took the tractor, wood wagon, and chain saw to the woods. When Gloria arrived with Lee�s cheerful bag of presents and a super sized birthday card, I informed her that we were going to take the Kubota RTV (named Toy Truck) and drive out into the pasture, cross the creek, go on up the hill, into the woods and take Lee�s present to him. Gloria was all for that. My sister just happens to be one of the best birthday party people around. It is her forte, her gift, to know how to make people happy on their birthdays. And, this ride up the hill, into the woods to deliver a birthday gift was right up her alley, er, woods. It was a beautiful warm Indian Summer type day, in spite of it being in November, so I grabbed up my camera and we loaded ourselves into the Kubota (Toy Truck). No birthday food or drinks, totally unnecessary with the wonderful adventure ahead of us of crossing creeks and hills and going into the deep woods to deliver a present. It was a party already. There just couldn�t have been a prettier November day. Who needed food and drink, too? The creek did cause us some concern with all the mud on either side and that water in the middle, but putting the Kubota 900 into 4 wheel drive took care of all worries. We simply went where we wanted and started up the hill to the woods. The herd milled around us and then followed us back into the woods as we headed to where Lee was cutting firewood. He stood there grinning at our approach, and if it was possible, the grin got even bigger when Gloria handed him his present. The cheerful birthday bag was just too much for the goats. They all wanted to come up and see what it was. Possibly a new way to carry feed? And, when Lee took out the huge super sized birthday card and it immediately started singing The Hampster Dance Song written by Roger Miller, Robert Deboer, and Anthony Grace, when he opened it, Well! That did it for them. They loved it. So, I suppose we also did have music for this woodsy, goatsy, birthday celebration. The Hampster Dance Song is so happy, it just makes you want to jump up and down and laugh. But, what the girls really wanted was that huge envelope the card came in. A tug of war started, the girls latching onto the envelope, but Lee finally won out and got his badly chewed envelope back to put his birthday card in. Then, everyone wanted to get into the cheerful birthday bag. But, Lee made them wait as he took each special gift out and thanked Gloria. The goats were somewhat intrigued with the cashews and special nuts, totally uninterested in the knife and flashlight, and individual packets of special tea to mix and make ice tea. What they really wanted was him to give them the large envelope back! 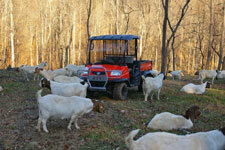 The goats all hung around us as we talked and laughed and I took pictures of us, the goats the dogs, the beautiful day and of course the brilliant orange Kubota. The goats were so joyful at being included in the birthday celebration, that they showed off by playfully butting each other, coming over begging for a petting and even two of the big livestock guard dogs came over for Gloria to pet them. The third and youngest livestock guard dog, two year old Dusty Sue, gave Gloria the Look if Gloria got too close to her. She allowed Gloria to pet her goats, but forget that idea of petting her. She was on duty, after all. No indulgences here. After a bit, the goats bedded down around us as we stood talking. Naturally, being big snoops and gossips themselves, they weren�t going to miss out on a word. It was getting later in the evening and having a bunch of chores still to do at the barn, Gloria and I loaded back into the Kubota and headed back home. Lee stayed to finish out his load of firewood before coming in. Yes, it was a wonderful woodsy goatsy birthday. 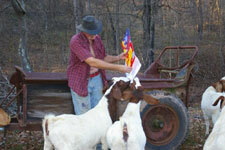 It would have been only more perfect for the goats if they could have taken that large envelope from Lee. Maybe, next year.